An overcast day slipped in between a stretch of sultry temperatures that magically appeared one day on the heels of a drizzly start to the summer. It was a perfect day for a hike, bathed in the soothing dryness of cooler temperatures, the sun’s burning rays contained within downy clouds that shrouded the sky. My partner and I moved into the shadows of the woods and looked up at a set of wooden stairs woven amidst the trees. I was about to take my first hike in almost four years. The Quarry Rock hike, as it is called, is located in the picturesque community of Deep Cove, a quaint neighborhood in North Vancouver home to vacationers, locals and a swelling number of tourists that come to kayak in the peaceful waters nestled beneath the lush mountains and test their stamina on the various trails that snake their way up the to the peaks. Classified as an “easy” hike, I looked forward to a pleasant level walk on the spongy earth of the forest floor, surrounded by massive trees with stories in their roots, the musical hum of bees, and chatter of the woodland creatures. Hidden somewhere in the deep foliage, deer snoozed away the afternoon dreaming of dusk, and bears prepared themselves for the coming fall, leaving their imprints in the soft mud of the trails. I came prepared with a sturdy pair of hiking shoes to hug my wobbly ankles and support tender knees, long cotton pants to protect my legs from the reaching arms of thorny branches and bug bites. Armed with bottles of water and light granola snacks, my partner and I set out beneath the soft cloud cover, grateful we would not be competing against the heat of the sun for this trek. 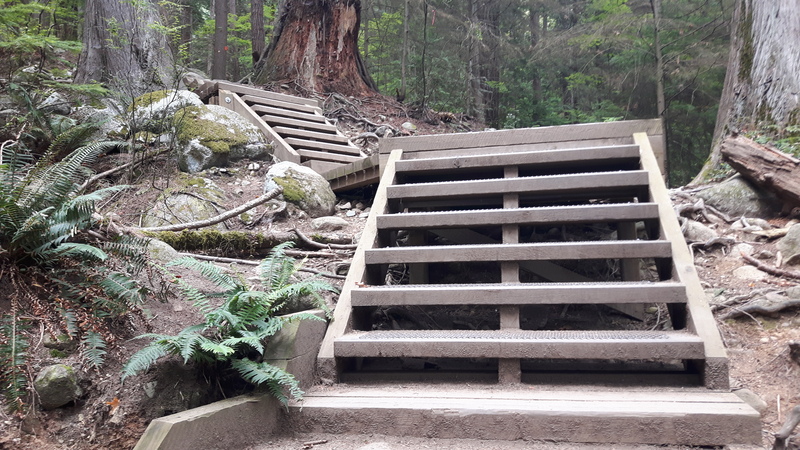 After a few tentative steps into the soft beauty of the forest I was faced with a flight of stairs going up – the first set of several leading to an elevation gain of 100 meters (328 feet). Easy hike? Are you kidding me? The last time I climbed a set of stairs for any length of time was on The Great Wall during a tour of China – for that once in a lifetime opportunity I dared myself to face that first step – I wasn’t about to let RA stop me. It’s been four years since that last climb. I’ve had time to condition, strengthen, learn how to manage life with RA, and prepare myself for this moment. 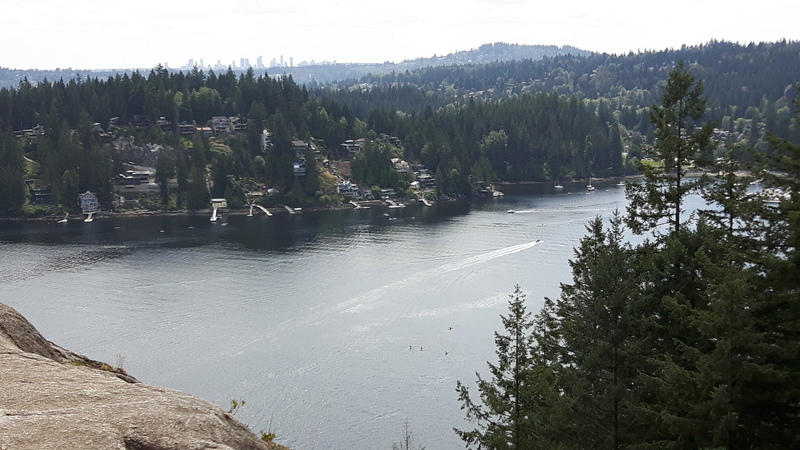 If I could climb the Great Wall, I could conquer Quarry Rock for this one day. I took one step at a time, taking breaks on the small sections of level ground linking the flights of stairs to each other. I stopped and admired the wooden bridges curving over fertile gulleys and small canyons. I breathed in the heady scent of moss and saltwater. We stopped when we needed to – there was no timetable, no urgency to finish. I tread carefully, making sure to place my feet firmly on stable ground and took care not to trip on exposed roots – like drivers on a highway, we moved out of the fast lane, stepping aside to allow others to pass. Hikers, runners, families and dogs surged through the trails – some had come to connect with nature, some to test their stamina, some to appreciate life, some to conquer, some to take photos, some to exercise – and I had come for a little taste of all these things. Two hours later, the trees stepped back and the narrow trail opened to welcome the sky and ocean. I stood on the rugged rock face looking out – eagles circled the sky above me, people moved liked tiny ants on the ground below me. A wave of vertigo engulfed me when I looked down reminding me how far I’d come. I was nowhere near the top but I had reached the summit of my world. A world that was sometimes malleable, bending with my body, sometimes unyielding and rigid; a world charged with beauty, dreams, determination, tragedy, happiness, potential, victories, failures, and survival. A world that offered me another chance to stand up in the face of RA, and proudly say “I did it”. Stairs are my nemesis. That, of course, now makes you my hero. Oh gosh thanks (blushing) I’ve never been anyone’s hero before. Yep, I hear you, stairs are not a favorite, although every now and then I make myself walk up a floor or two to keep my body moving – I always take it slow and pay attention to pain. And that beautiful hike was so worth it – maybe next year I’ll try it again. 😉 Wishing you well. X.
Wow! What beautiful pictures! I need a knee replacement so stairs are next to impossible until I get the surgery. BTW, I love the name of your blog. It’s so accurate. Thank you. Hopefully you won’t have to wait too long for the surgery. I wish you well and hope that you will be able to conquer stairs again. Cheers. The pride rings through in your writing. Do you remember the childhood book of the little engine that could? “I think I can, I think I can.” That’s how RA affects us – we are tentative, but we think we can. And sometimes we do!!! Have a great day. Thank you. It was so worth the effort in the end. Hoping all is well with you. X.